Lewis & Clark was incorporated on January 31, 1990 and one of the first orders of business was to select a lead engineering firm. After a selection process a contract was signed with Banner Associates of Brookings, SD on August 8, 1990, and they have been the lead engineering firm ever since. Dave Odens was Banner’s lead engineer on Lewis & Clark from August 1990 until September 2014. Tim Conner has been Banner’s lead engineer on the project since October 2014. Banner partnered with HDR Engineering of Sioux Falls, SD on the design for the water treatment plant, wells and bank stabilization system. HDR also designed the Iowa – Segment 1 pipeline project. Otherwise, Banner has designed all the other pipeline, meter building, pump station and storage projects. Banner also wrote the Final Engineering Report. 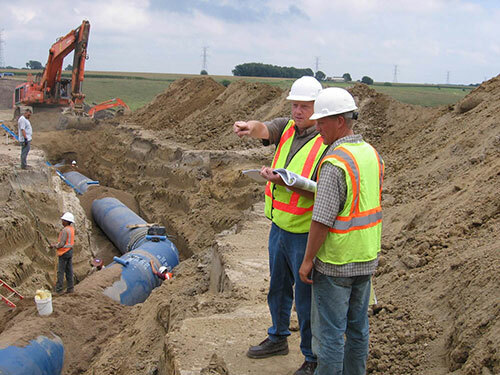 Various sub-consultants have also worked extensively on the project, such as TRC Environmental Corporation of Laramie, WY, GeoTek of Sioux Falls, American Engineering Testing of Sioux Falls, RustNot of Boise, ID, West Plains Engineering of Sioux Falls and McLaury Engineering of Elk Point, SD. The Bureau of Reclamation also provides engineering oversight with regard to review of the plans and specs, and has been a close partner from the very start. As of April 2017 the amount spent on engineering fees is $49.5 million. This amount will continue to increase as construction progresses.